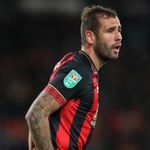 Cook returned to action in Bournemouth’s 5-0 drubbing of Brighton on Saturday after spending almost two months on the sidelines after getting an abscess following a groin injury. But he admits having too much time to think about the problem and not knowing when he would recover took its toll, with a specialist also warning his career could be affected if the infection spread to his bone. “It was a strange one because it wasn’t an injury as such, I got an infection in my pubic joint which put me in hospital for six nights, which was really difficult to take,” he told Sky Sports News. “I had a lot of pain and a lot of time to myself to thinks things over and sometimes that can become a little bit dangerous. “I had a lot of people around me and people who came and saw me. It was a long period of doing nothing – I was on antibiotics for six, seven weeks – so a long process. “The mind can play tricks on you sometimes. When you are alone and feeling a little bit down and negative, you can’t see any light at the end of the tunnel. “I was in hospital with a lot of sick people and that’s not really where you want to be. I didn’t know how long I was going to be in hospital for and I hadn’t been told a date for when I was coming out. Cook, who turns 28 on Friday, will hope to feature again when the Cherries play already-relegated Fulham at the Vitality Stadium this weekend and he has spoken candidly about the problem and its effect on him, physically and mentally. “I had some tendonitis in my groin and went for an injection to subside the pain,” he added. “I then somehow developed an abscess on my pubic joint, which then spread into my groin. It left me almost paralysed through pain, on crutches. “I very quickly went from being a normal, mobile footballer to being on crutches. I couldn’t get my trousers off or get changed myself, so it was a scary moment in my life and my career. “Times like that make you question everything and appreciate what you had before. “It wasn’t until I got out and saw a specialist – I was quite eager to get back into routine and he had to try and slow me down – and he told me what complications there could be. “Because the infection was still there when I came out of hospital, it had to be managed. “If it had of spread into my bone, he said it could affect my career and the infection would have to be cut out of my bone. Time for City to trust Sane?